We held the 2018 AGM on Saturday during Armistice in Dunedin. The attendance and discussion of the delegates and observers was once again very good. It definitely works having the AGM during an exhibition. However, the trouble at this stage is there doesn’t appear to be any national exhibition planned for this year or next year. There was only one remit and that, of course, related to a subscription increase. I was pleasantly surprised how quickly the remit passed and can only hope it was because you think we are doing a reasonable job and presented the arguments for the increase clearly and fairly. There was no voting required for executive positions, so the routine side of the meeting was fairly short. Thanks to those seven or so societies who nominated me for another year. I believe I still have some unfinished business and hope the programmes Federation is trying to put in place will proceed well making it another satisfactory but busy year. Armistice is now over and just needs some loose ends tidying up. It appeared to have been another successful exhibition with a good number of public though with lots of new faces I didn’t recognise. There was a good amount and range of entries with approximately a third coming from Australia. I understand the dealers did well but, because I was on the jury, I didn’t have as much time to go to the dealers or look at as many of the other exhibits as I would have liked. This was the first time I had ever been to Dunedin. While I didn’t get a chance to look around much, those parts I did see suggested it was a very nice city. I intend going back in the near future and having a good look around. As I mentioned above no society has put their hand up to host a national exhibition this or next year which is a shame. I find exhibitions are great places to meet up with fellow collectors. Even though we have NZ2020, the international, in early 2020 I am sure we could fit a half or full national later on in the year. We have the Australasian challenge in Sydney in the middle of 2019. Let’s see if either the North or South Island team can retain the trophy for New Zealand making it three times in a row. There has been a lot of progress with NZ2020. The venue and accommodation is booked; trade stands (dealers and philatelic agencies) are being taken up; and, invitations to the different FIAP member countries asking for commissioners have been sent. A letter has been sent out to Federation member societies identifying ways they and/or their members could help. Please give this your attention so we can ensure our New Zealand international exhibition is a success. We are in the final stages of the refurbishment of over 600 frames. Those of you who visited Armistice would have seen how well they looked. The work on the frames could see them last another 30 years. One of the pleasing things we do each year is giving out philatelic awards to deserving people involved with our hobby. The recipients described in this newsletter fully deserve their awards and I am sure they will continue with their involvement for years to come. I do regret the lateness of this newsletter. By the time it has been produced many of the annual events it records are closer to the next one in 2019 than the last. As a result the newsletter has become more a record of long-past events – a useful function but not what we are really trying to achieve. At the last meeting of the Federation executive it was suggested the website would benefit from having more up-to-the-minute articles posted on the site’s Home page. This would enliven the page and might encourage more regular viewing of other areas of the site. The obvious way to achieve this is to publish reports of philatelic events around New Zealand shortly after each occurs. Other newsworthy items affecting New Zealand philately here and abroad should also be included. This seems likely to impact on the newsletter. However, there are still many of our society members who do not have access to the internet; they and others like to read hard copy material; and, the newsletter can be a formal, longer-term record and acknowledgement of the activities of our members and of individuals such as exhibitors and our Federation award recipients. Future newsletters are likely therefore to be a collection of items that may well have already been published on the Federation website but it should also provide additional material than appears there. As always your editor is keen to hear about the goings on of our societies and their members. There was a good response from societies nominating members for NZPF Awards. Wherever possible Federation likes to have a member of the executive presenting the award but this is not always possible. Past executive members (often previous office holders) are asked to carry out this function and where able they have been pleased to carry out this very satisfying task. 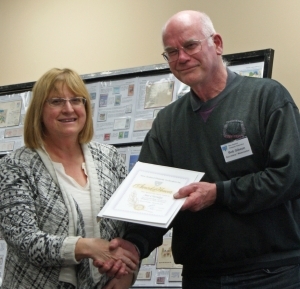 Louise presented her award by Barry Johnson, president of Marlborough Stamp Collectors’ Club. The Marlborough Stamp Collectors’ Club nominated Louise who has served continuously on the club committee since 2004 – for at least three years as Club president, several years as Club secretary and is currently serving as Club librarian. 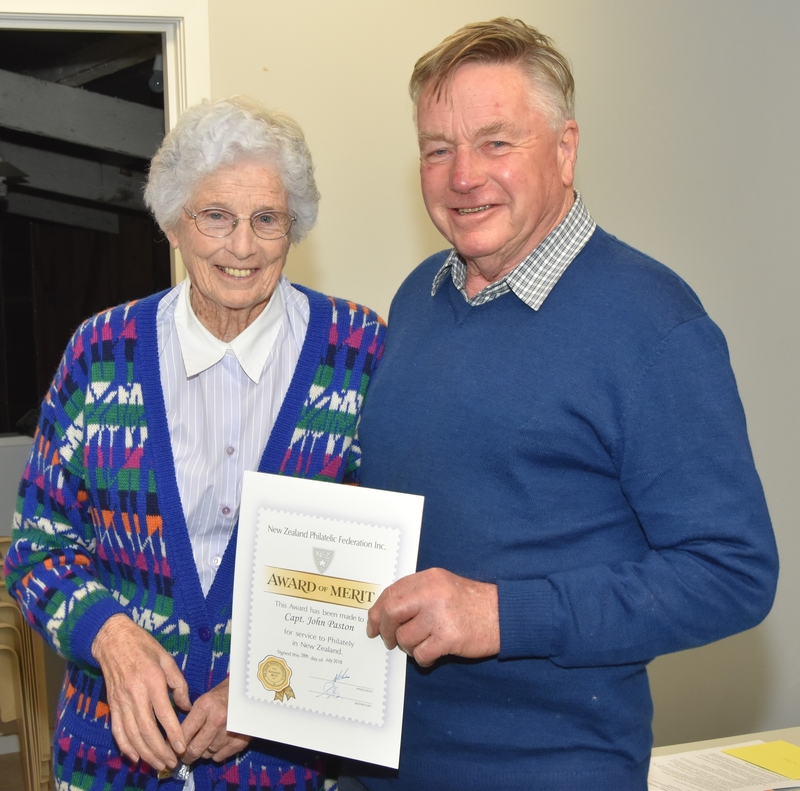 She was very active on the Clubrooms Committee as Charity Funding Co-ordinator which raised some $30,000 towards the clubrooms project and continues in this capacity. Louise has exhibited at several NZ and Australian exhibitions with encouraging results. She has participated in, and contributes at, exhibiting workshops and has given talks to local groups on her stamps. Barry Scott, Northern Region delegate presents Lindsay with his award. The Waikato Philatelic Society nominated Lindsay. Their application advised Lindsay is very active in all aspects of philately. He is a member of ten local societies and three overseas. In the case of Waikato he was their Vice-President for eight years and included provision of financial assistance on their circuits. He has been the President of the Royal Philatelic Society for three years. He was the secretary and driving force behind the successful Royalpex 2017 National Stamp Exhibition and became treasurer following the untimely death of Geoffrey Drew. Lindsay, at the time of his nomination had five multi-frame and three one-frame exhibits. He is well known for giving talks around the country on these and other aspects of his collecting. Lindsay is a philatelic judge and has been Commissioner to two overseas exhibitions. He is currently undertaking research in a number of areas and has published papers in the journals of both the Royal Philatelic Society of NZ and of The Royal Society of London. His philatelic knowledge and achievements have been recognised with Fellowships of the Royal Philatelic Society of NZ (2016) and the Royal Society of London (2017). Lindsay is also a trustee of the NZ National Philatelic Trust. Major contributions to the Philatelic Youth Council and youth philately in general including being a leader in the Christchurch Youth Stamp Club for most of the last twenty years; co-ordinator of a holiday stamp programme with Christchurch City Council several times; PYC secretary for many years; PYC Stamp Camp leader on numerous occasion at many different venues around NZ; and, has been NZ’s delegate to the FIP Youth Commission. Sue has been involved in several NZ philatelic societies and an overseas society and holds several philatelic administrative roles including secretary of CANPEX, secretary of the NZ Philatelic Judges Assoc. ; and, she has been secretary and president of the Christchurch Philatelic Society and currently is its Vice-President. Previously a South Island delegate to Federation she has recently returned to that role. A philatelic judge of many years standing Sue has judged at many exhibitions here and in Australia and Canada; has been a team leader over many years in New Zealand and was Chairman of the Jury at Blenpex and at the time of her nomination was to be the Chairman at Armistice. 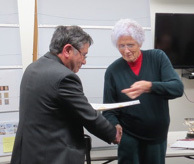 She has co-ordinated with other Christchurch judges philatelic seminars held in Christchurch, has actively participated in seminars elsewhere and continues to judge in local club and inter-club competitions. She has many one- to multi-frame exhibits in classes including Open, Postcard, Thematic, Revenue, Marcophily and Postal History. These and other parts of her collections are used in regular talks and presentations to societies. She has also been involved in mentoring many youth and adult exhibitors. Sue has written articles that have appeared in the journals of societies to which she belongs. The Marlborough Stamp Collectors Club nominated Grant. He has been a committee member since 2010 and was the treasurer and assistant hall manager for Blenpex 2012. He became treasurer for the Clubrooms accounts and once again fulfilled this role successfully. He has been responsible for considerable activity in the provision of water and electricity services to the rooms and garden surrounds, waste water disposal and building renovation work. His collection of NZ full face Queens has been exhibited nationally with increasingly rewarding results and has formed the basis of talks to other clubs. Jenny Banfield, past President of Federation, presenting Colin with his award. 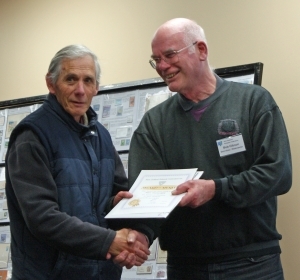 The Manawatu Philatelic Society nominated Colin who has been a member of the society for over 40 years. He has always taken an interest in club activities, but even more so since retiring. In his earlier days he had a short spell as treasurer. He was Publicity Officer for two major National Exhibitions held in Palmerston North in 1982 and 1999 and was Hall Manager for 2010 Palmpex. Colin joined the committee in 2014 and this year he has taken on the position of Vice President. He participates at all levels within the society. In 2018 he won the PIM Cup, the society’s annual 16-page competition. He has also won the Campbell Paterson Trophy for the past 2 years – this is for accumulating the most points in our monthly one-page competition. He always has something to show in our Items of interest segment at each meeting and along with looking after the sales table he is one busy and important person. 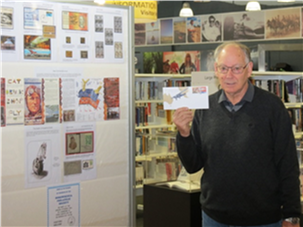 Colin in recent years has given presentations to a number of North Island clubs, bringing to life his extensive collections of stamps relating to German occupations and Plebiscites. He has been an integral part of our Society teams competing in various inter-club competitions. He has also taken on the task of promoting stamp collecting by co-ordinating displays at the Feilding Library as well as putting his hand up to do a short presentation at a Hobbies afternoon being held soon at the Manawatu Library. Most importantly Colin has managed to showcase his many talents in revitalising the annual “Convention” (now renamed ‘Central District Stamp, Coin and Postcard Show’) held in Palmerston North. He has done an outstanding job being the driving force behind the previous two extremely successful events, which has enticed many more lower North Island societies and dealers to participate. John with his award presented by Jenny Banfield. The Hawkes Bay Philatelic Society nominated John. He is currently President of the Society and has held that position since 2011. He is also Editor (since 2000) of the “Gannet”, the Society’s newsletter, which won a Large Silver award at the Macao 2017 FIAP International Exhibition. We understand the newsletter is widely read and helps provide inspiration to other society editors. John was a highly effective publicity officer for our first National exhibition Baypex 2004 and was also a key member of the committee which staged Baypex 2014. Both exhibitions involved collaboration with the Hastings Stamp Club and he has always encouraged excellent communications between the two societies and also with the Palmerston North Convention. He received the Federation Deserving Philatelist Award in 2005 and since that time has continued to show great enthusiasm for the hobby and to encourage others at every opportunity. He has received awards at exhibitions regionally, nationally and internationally with entries predominantly of a nautical theme, the Suez Canal, Shipwrecks, P & O Liners, Britannia, British Royal Yachts for example. He has also developed into a national judge, serving most recently at Royalpex, held in Hamilton November 2017. His book Postcards of Hawke’s Bay, New Zealand, put together with “Safari”, was launched in 2014. John has travelled widely to other societies as guest speaker, and willingly shares his knowledge with others. Amy receiving the trophy from Tim beach, Northern Region delegate and PYC Chair. Amy was nominated by the Philatelic Youth Council of NZ. Their citation made the following points in describing Amy’s contributions. Amy has been a member of the City of Sails Youth Stamp since 2008 and since then has won multiple club awards. She attended PYC Stamp camps most years from 2009-2017 and won most of the trophies available including the Rob Hunt Cup, Val & John Hunt Award and Iris & Geoff Tyson Award. Has attained the PYC Achievement Awards including Gold. Has given talks at a number of Auckland stamp clubs (South Auckland, Auckland, North Shore, etc.). Has put together a number of collections/exhibits including NZ 1975 Definitives, TS Elliot – A Guide to Cats, and The Ocean Wonders from Top to Bottom. Has won medals at National and International Philatelic Exhibitions including: CPS100 2012 – LS; Upper Hutt 2013 – V; Baypex 2014 – LS; Adelaide 2014 – LS; Malaysia World Youth 2014 – LS; Capital Stamp Show 2015 – LV; Adelaide 2016 – G; Christchurch 2016 – LS and Royalpex 2017 – G. At the 2017 Auckland Philatelic Society exhibition she won overall best exhibit in competition with adult exhibitors. Amy has also helped other youth collectors with their exhibits and their collecting advancements whenever asked and also as part of her own initiative. Amy has also helped support and promote the hobby at Regional events such as Modelex over the last few years. Amy has also helped teach other youth collectors to improve their knowledge. Jenny Banfield presenting Tony with his award. 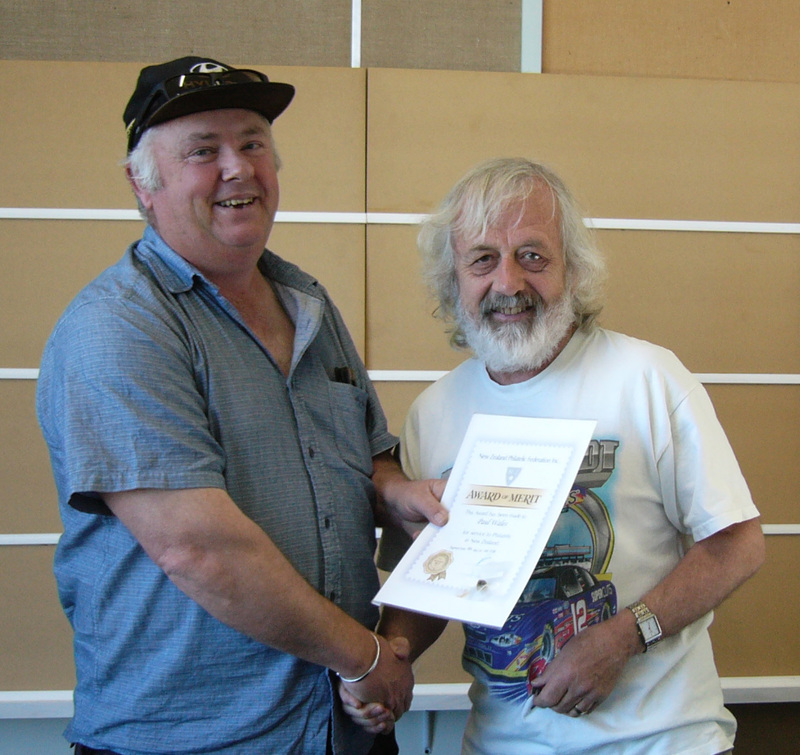 The Manawatu Philatelic Society nominated Tony. Tony has had for many years a special interest in the first day usages of New Zealand stamps. He has assembled what would be the best collection ever formed of New Zealand postal history covers and stamps either proving so called issuing dates or showing material with the earliest known usage. In 2004 Tony produced the second edition of his 462 page hardbound book in association with the Royal Philatelic Society of New Zealand entitled New Zealand First Day & Early Use Covers & Stamps 1855-2003. It contains scans of stamps and covers detailing the earliest use where known. The search for information has been ongoing for many years and Tony can be seen at most exhibitions with a very worn copy of his book searching dealers stocks looking to add more detail. Tony has written countless articles for many newsletters including the NZ Stamp Collector, Mail Coach, Captain Coqk and the Manawatu’s own newsletter to name a few. He has exhibited extensively in New Zealand and overseas with his last success being at Royalpex 2018 being awarded a Large Gold with felicitations. Tony is a National Judge and on the list of International Judges for FIAP Traditional. Past President and Fellow of the Royal Philatelic Society of New Zealand and in 2013 produced their 216 page book 125 Years of the Royal Philatelic Society of New Zealand. Recipient of the Royal Philatelic Society of NZ’s Collins Award in 2001. Has given numerous talks to Societies. A major stalwart of the Manawatu Philatelic Society, joining in 1982 and having hardly missed a meeting. He has been their honorary solicitor since 1984. Tony has been the secretary of the Central Districts Philatelic Trust for many years. Always ready willing and able to give advice. Alan receiving his award from Bob Gibson. The Air Mail Society of NZ nominated Alan and letters of support were forwarded along with additional information from three other societies. For 37 years (since October 1988) Alan has been the newsletter editor for the Air Mail Society and during that time he has not missed an issue. For some 30 years he has worn the hat of secretary and treasurer. Alan clearly has without doubt has been the backbone of the Society. Alan has been a member of the Christchurch Philatelic Society since 1978. In that time has been an active participant in their events, a contributor to their newsletter Captain Coqk and was editor for the book prepared to mark the society’s centenary in 2011. 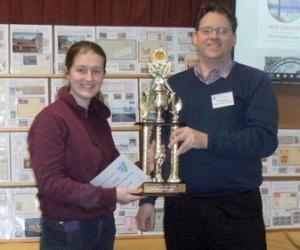 In 2017 Alan was an apprentice judge for the 15th NZ National Philatelic Literature Exhibition which was hosted by the Christchurch Philatelic Society. Alan has been a member also of the New Zealand Stamp Collectors Club of Christchurch. For the past 19 years (without a break) he has operated their Sales Table at the back of the meeting room. Each month he brings along many show boxes of members’ material which is sold others. Alan sorts this and the proceeds go to the club funds. He is one of their regular 1-page Competition entrants probably having put up more entries than anyone else in the years since the event started. It is also very rare if he doesn’t also contribute to our items of interest. 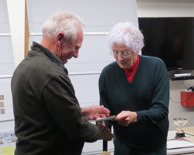 The Southland Stamp Club notes that Alan makes a point of coming to Invercargill each year to visit family and has displayed a wide range of interesting material when in town at the club’s meetings. Alan is regular contributor to the NZ Postal History journal Mail Coach and provided two chapters in the Royal Society of NZ’s The Postage Stamps of New Zealand Volume X as well as occasional items for their newsletter the NZ Stamp Collector. Paul receiving his award from Josh Black, Southern Region delegate. 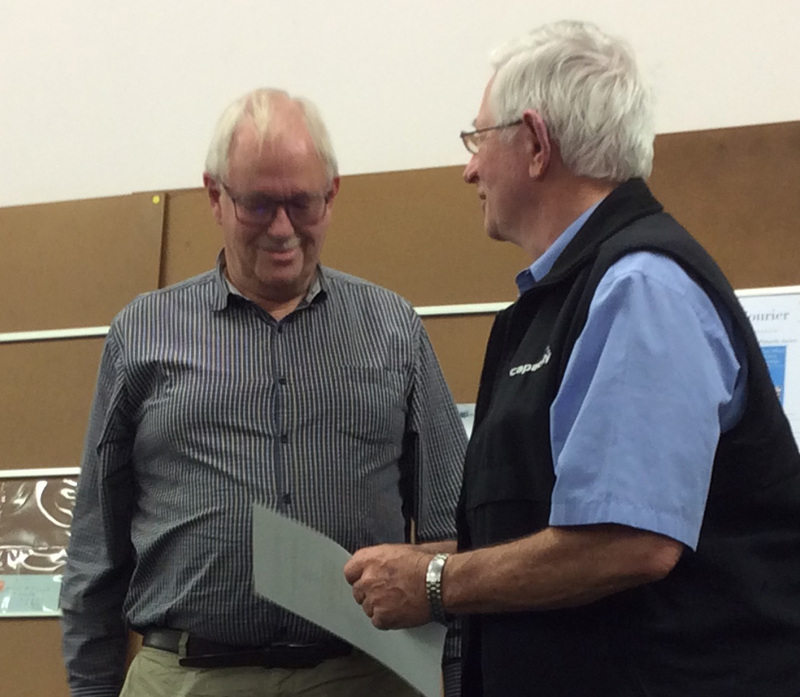 Paul was nominated by the Christchurch Philatelic Society. Paul first exhibited at the 1977 Panpex ’77 exhibition in Christchurch. Since then he has exhibited on a regular basis both in New Zealand and internationally. He received a large Gold and the Gordon Kaye trophy at the 2012 Association of British Philatelic Societies’ Stampex in London. His reputation as an entertaining speaker with interesting material means Paul has been invited to speak to various philatelic societies in NZ on his exhibits and other collections. He has been awarded the Christchurch Philatelic Society’s Anderson Cup for the year’s best talk on three occasions and in 2008 won the Auckland Philatelic Society’s Mullenger Tray for best speaker for the year. He has also been invited to speak to various societies in Australia, USA and the UK. He has spoken at many of NZ’s Youth Camps and has provided monetary and material support to them. Paul is a member of various societies in New Zealand and overseas. He was one the first dealers to become a member of the Royal Philatelic Society of London when they allowed applications from stamp dealers. In 2011 he received the Christchurch Philatelic Society Centennial Award and in 2016 was made a Fellow of the Royal Philatelic Society of New Zealand. Paul was a trustee on the NZ National Philatelic Trust for many years, he has organised NZSDA stamp shows in Christchurch and been on the organising committees for national Stamp Exhibitions in Christchurch. In 1977 was involved with fundraising for the Christchurch Philatelic Society purchase of 27 Worcester Street which became for many years the home of philately. He was a shareholder and for a period acting Chairman of Christchurch Philatelic Properties Ltd.
Paul is on the executive of NZSDA and was for two years President. He is a full member of NZSDA, APTA (Australasian Philatelic traders Association), PTS (Philatelic traders Society td, London) and IFSDA (International Federation of Stamp dealers Association). As a stamp dealer he has had stands at various shows in New Zealand, Australia, US and the UK and for several years was the only NZ dealer with a regular stand at the twice yearly London Stampex shows. Paul had had philatelic articles published in various publications around the world. The following details the information presented to the Federation meeting in March by your regional delegates. In many cases the information has been provided to them directly or through the clubs’ newsletters. Some time is set aside each meeting to discuss these reports as they are intended to inform the executive of the activities of the Federation’s members and identify issues they might be able to address. They are included here to show the wide spread of activities of our societies around the country. We are sure you will find some of the comments of interest and some may surprise you. Please ensure your delegates are advised of your club’s activities and concerns so they may be raised at the Federation’s meetings. Stamp Camp was held 22-28 April in Christchurch. The Camp was held at the Wigram Air Cadet camp site. While the number of youth attending camp was down on previous years good work was done by those who attended, and the quality of the exhibits was very good. The two aspects that are making the camps viable is the ongoing funding from COGS and the reduced camp site costs with PYC using Air Cadet sites. The camp was a success and broke even with the support of the extra funding obtained. Camp cachet designed and drawn by Sharon McTaggart from Hutt Valley Junior Club. 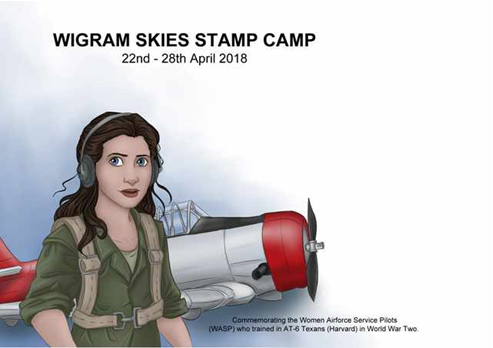 Sharon McTaggart was also invited to design the Stamp Camp cachet for the camp cover. While the good news is PYC continues to attract funding from COGS to enable its core projects (website, stamp camps and Fun Philately) to continue it is difficult to get new members on the executive with many of the existing group getting older and reducing their workloads. As a result we are struggling to keep up with our existing activities. Work is, however, continuing on looking at their existing publications – PYC Guide, Fun Philately and Leader’s Resource Kit – to update content and post them on the PYC website. The clubs are finding it hard to attract members as well as leaders. Ross Gainsford has stepped down from running the Hutt Valley Juniors and that will leave a big hole. City of Sails was hoping appearance at Modelex would help get new members however the event was cancelled a few weeks out. The close proximity of the Armistice Stamp Show to the Waikato Ambury Shield resulted in the PYC Inter-club not going ahead. However, it was good there were 15 Youth entries at Armistice with 11 being from New Zealand. Good attendance at exhibition in June. The Council did not leave enough tables out so there was scramble to find some at the last minute. By booking another room in the hall more tables can be guaranteed for future bookings. A quiz based on The Chase TV format was very successful. Their meetings have been well attended. Bruce Chadderton has been booked to present the Keith Griffiths Memorial Lecture in 2019. The club has decided it will no longer be incorporated and has advised the Registrar. Steady attendance of 10-12 members. It celebrated its 50th anniversary on 4 November. Stamp Fair in April had a moderate attendance but did result in one new member. Four prospective members attended shortly after, some with partners, boosting attendance to 17 one months from the usual 10-12. Since then they report 4 new members and a further 3 prospective members referred by members from the fair and the NZPF website. Monthly newsletter is sent to members and other societies. The society has had some busy months with a Stamp Fair in May, Combined Northern meeting in June and another fair in August. Member numbers are reasonably steady at present with 10-14 at a meeting. They are finding the day time meetings are popular in the winter months. From the February 2019 meeting they have changed all their meetings to the daytime (start 1:30pm). Unfortunately, the club is suffering as everyone is, from so many of their members getting older. It is more difficult to find those capable of helping. Monica has had the newsletter landed back on her which she could well do without but there seems there is no-one willing to step up. The Combined meeting went off extremely well with just over 30 people present. The three speakers were unbelievably interesting and better still the meeting made a very slight profit largely due to a donation of $75 from the NZ National Philatelic Trust. The event was well supported by members of the Keri Keri club which, it is hoped, will be hosting the 2019 meeting. Battle of the Hills, the annual competition between North Shore and Waikato was won by Waikato. The annual exhibition was held on 6 October where the best in show was won by Ross Marshall. Work is still progressing on cataloguing and sorting the Alan Berry Library. Plan to have four out-of-town speakers per year – already early 2018 their programme for 2019 was full. The society is using the free listings in the local newspaper and Coffee News to advertise their society and meetings. The Ambury Shield Day was hosted by the Taranaki Philatelic Society. The competition was won by the Waikato Philatelic Society and individual honours were shared by Ross Marshall and Bruce Tapp. During the April to Novemnber 2018 period there has been a range of journals and newsletters received by the delegates. Alongside these journals and club information for the Wanganui Philatelic Society has been garnered from their website. Overall, most Societies are functioning well. Membership numbers and attendance at monthly meeting seem to be holding up across the region. Where Societies have a regular attendance of 15+ members their programmes are well defined, with a good range of topic and speakers to meet most members’ interests. Some Societies have a very good social programme that involves club dinners such as the Taranaki Philatelic Society where the Federation President was the guest speaker in May. Smaller Societies tend to be a gathering point for likeminded individuals to share ideas and their collecting interests. Over the period April – July a number of Societies cycled through their AGMs. From the reading of the newsletters, most were non-contentious and did not leave on-going gaping vacancies post-AGM. In the main Office holders and committee vacancies have been filled to keep these organisations moving along. There is an observation that for most Societies the burden of management falls to the few. It was good see a new’ish member (Chris Newlove) take up the role of secretary for Hutt Valley as this brings some “Youth” into this role for the Society. There has been a good range of speakers across the region. The travels and talks of Lindsay Chitty and Jenny Banfield were especially noted as they have been presenting to multiple societies during the period. Federation award recipients were also adequately noted within their local newsletters. Overall clubs and societies are progressing in the main with meetings being held with generally good attendance. From discussion with some society members at the Armistice Stamp Show it is evident that within the societies there is good engagement from the current members. The most pressing issue for societies is the willingness of members to provide the administrative support necessary to keep their societies going. The workload seems to continue to fall onto the few time and time again. Some societies are fortunate having “younger” people coming through. This issue will only increase and was discussed at Federation’s last meeting. Is there a possibility of providing a range of support services to smaller clubs that without the adequate administration would otherwise have to fold? There was also a liberal set of comments in the newsletters on the removal of postal cancellations by NZ Post. A number of the central region societies outlined their comments to and the response from NZ Post. Simon Allison also spoke directly to the Hutt Valley Society during the NZ Post speaking slot in September. It has been noted that a small on line cancellation has come into operation since. The following is a selection of activities that have happened across the region during the reporting period. The society visited the NZ Post Collections and Solutions Centre on 11 April . This is an annual visit that the Society makes to the centre. The event involves an overview of the current and future issues for both stamps and coins that Post is bringing to market. The 2018 Collectors Expo and Convention, Palmerston North was held on 14 April. This is an annual event organised by the Manawatu Philatelic Society with Colin Dyer playing a key role. Leigh Gravestock attended as the Central Region Delegate and attended the Central Districts meeting held during the day. The 2018 NZSDA/Wellington Regional Stamp & Coin show incorporating the Neville Harris Competition was held in Lower Hutt during the weekend of 26-27 May. Entries for the competition were received from six Societies. A decision was made to judge the entries before the show and Jenny and Norman Banfield kindly offered their home as the judging venue prior to the Show weekend. This year the winning Society for the Neville Harris Trophy was Wellington Philatelic Society with an average of 81 points across their exhibits. 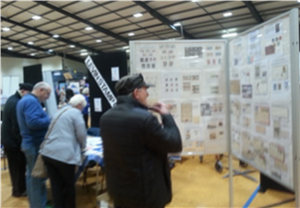 The Hutt Valley Philatelic Society was once again supported by exhibits from Juniors that in the company of adult exhibitors faired very well. The Stamp Show was reasonably well attended and what was more pleasing was at least one new adult member (HVPS) and three juniors recruited (HVJSC) joined up after capturing information from door entry. The show is to be held during the weekend of 25-26 May 2019. The annual Te Papa visit was arranged for August and while this is a joint Wellington, Hutt Valley and Royal Society meeting this event was also well attended from members across the region and from outside the region. The focus this year was on George VI issues and there was a great range of material from the Te Papa collection and material supplied by guest speakers from around the country. The joint societies provided a supper at the end of the event. During the weekend 7-8 July the society attended the Model Expo providing four frames of exhibits and a stand that offered information on stamp collecting. This very active society has once again demonstrated this. See the special report below. The society has settled into a new working pattern with new committee members. The issue of the club Circuit book continuance seems to have been solved by outsourcing this to Earle Howe from NuStamps in Auckland. Earle runs a circuit called “Stamp Galore Circuits” and the Society is now making use of this instead of running their own circuit books. Vendors’ commission on sales is 15% including GST and there is no insurance offered to sellers. Marlborough has had a busy schedule with guest speakers and meetings being held on the Sunday afternoon during the Winter months which means our older members who wouldn’t normally go out on a cold night can come along and enjoy the clubs speakers. Let’s face it no one likes going out on a freezing cold night and their Sunday meetings are very popular. In May Paul Wales spoke on being a stamp dealer. Some of the anecdotes he shared were highly enjoyable and he had a number of nice items brought along to show. In June Jenny Banfield gave a thoroughly enjoyable talk on her ‘Mesopotamia to Iraq’ postcards which was very well received. It was great that she and Norman were also able to offer Ron Hebbard some good one-to-one advice on his revenue exhibit. July was the club’s selection for the interclub exhibition. We had seven entries and, as in the past, the five entries from Marlborough were selected by popular vote. The Inter-Club was hosted by Marlborough and a separate report is provided below. In August the club hosted Nelson on the annual meeting between the two clubs, a most enjoyable day for those who attended. They are pleased that their sale days are attracting new members – not hundreds of them but every new member we gain is an asset. One of Nelson’s main events was an open day in May to help attract new members. Recent “Top of the South” immigrant, David Loe reports that new members have turned up at the meetings – a good sign in these days when the hobby is competing with so many other things. The AGM was held in June and the highly popular July meeting was a buy sell and swap followed by a pot luck dinner. This is seen as a great idea to help members get to know each other better. Christchurch reports have not been forthcoming but with the appointment of Sue Claridge as the second South Island delegate we hope this will improve. Robert Duns is always happy to talk on how the library is doing as it constantly expands and also their postal museum. The club had a visit from John Watts who showed a Christmas display including ephemera and gave a wonderful talk. Their regular stamp fair was held this time in Mosgiel with mixed results but their auction was well supported with a four figure turnover. A mid-winter dinner was held in June. The club had the misfortune to lose a $4,000 exchange packet. The last recipient in Christchurch sent it to the next in the list but did not keep the courier receipt. They are pursuing options with the last buyer and will be paying out the vendors. As a result they are advertising high value books in the newsletter and sending them out on request. Due to the club’s policy of posting newsletters out with hand cancellations the subscriptions have been increased by $5 to cover the increase in postage. Horowhenua Philatelic Society president Michael Christensen and part of the Kingsford Smith display. 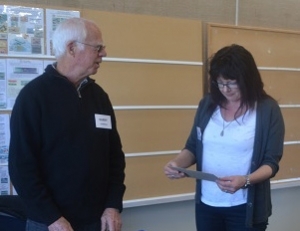 The Horowhenua Philatelic Society participated in two events in the Levin community. The first was a display celebrating the 90th anniversary of Sir Charles Kingsford-Smith’s crossing the Tasman by air in September 1928. Eight frames of related material were on display during September in the local library, Te Takeretanga o Kura-hau-pō. The display attracted a lot of interest from people who viewed it. An article in the local Horowhenua Chronicle highlighted the display. The NZ Aviation News also ran a feature in their publication. Horowhenua’s “Age on the Go” display. For about the fourth time our Society has taken part in this community event highlighting groups and facilities available to those of the retired variety. Our stall always attracts people who “used to collect stamps many years ago” and now wonder what to do with them. We can offer advice in this area. A couple of competitions provided an interest as well as having a selection of philatelic material on display. At the July and November meetings the executive reviewed their efforts to visit as many member clubs/societies as they could during 2018 which resulted in over 70% of our members being visited. Unfortunately a number of members have still not been visited and special efforts will be made to visit these during 2019 along with further visits to other members. Displays of the entries for this event will be shown along with other displays 10:00-4:00 on Saturday 28 and Sunday 29 September at “The Hub”, Kilbirnie Crescent, Kilbirnie, Wellington. All societies will receive full details of the competition including rules, fees, dates, etc. at some time in the coming months. The annual event run by the society will be held 10:00-4:00 on 5 October at St Georges Church Hall, 2 The Terrace, Takapuna. Societies will be informed as details are finalised and for updates check their website http://www.northshoreps.com/html/events.asp. • Stockholmia 2019, http://www.stockholmia2019.se 29 May to 2 June 2019. This exhibition is open only to members of the Royal Philatelic Society London, the world’s oldest philatelic society, which is celebrating its 150th anniversary. A number of other exhibitions have been indicated but no confirmed dates have been notified. These include Taipei 2020 FIAP, Malaysia 2020 FIP, Newcastle 2020 Australian Half National. The venue is the Ellerslie Event Centre – more commonly known as the Ellerslie Race Course. There are good transport options to the site (including public transport – bus and train), plenty of parking and nearby hotel accommodation. This will be a great opportunity to see exhibits rarely if ever seen in this country and a wide range of dealers and postal administrations offering their products. The following is a brief outline of progress to date on the 37th Asian International Exhibition. The Trade area, Exhibition hall, Jury/Bin and other rooms at the Ellerslie Event Centre have been booked and deposit paid. Official accommodation (Ibis Ellerslie) and the venue for the Awards dinner (Novotel Ellerslie) has been viewed, some negotiations regarding rooms, etc. have taken place with Novotel Ellerslie which manages the shared facilities. The rooms have been booked and the deposit paid. The required contract was signed at Macao by Gary Brown, on behalf of FIAP, and Stephen Chivers as president of NZPF. The first of three instalment payments for FIAP patronage has been paid. The website http://nz2020.nz is operational and provides a wide range of information about the show. The IREX for the show has been approved by Gary Brown (FIAP co-ordinator), accepted by FIAP and can be found on the NZ2020 website. Stephen Chivers personally handed these to the FIAP member countries at Bangkok 2018 and an electronic version was sent shortly after. The application form for exhibitors and the additional literature exhibit information form have been posted on the website so commissioners and others can access them. Over one half of the 40 trade stands have been already sold. People are able to join the Patrons’ and Supporters’ Clubs or donate to the show on line and several have already taken up these options. A number of New Zealand societies have already pledged financial support. A letter has been sent around to New Zealand societies. This advises them about the show, indicates how they might be able to assist the organising committee financially (directly or through purchase of product) or through the provision of voluntary help leading up to and during the show. Pamphlets have been prepared and were circulated at Praga and Macao and were handed out at Bangkok. Some have been circulated with the society letter described above. I was appointed as Commissioner by NZPF a month before this exhibition as the previously appointed Commissioner was unable to attend. At that stage all NZ exhibits had been entered and accepted for this half national Australian Exhibition. It was also the centenary year of the Newcastle Philatelic Society. The Exhibition was held at the Newcastle Showground Exhibition Centre, Brown Road, Broadmeadow – flight to Sydney then a 2½ hour train journey from the airport. NZ and Australian Customs both inward and outward very straightforward, in fact I had to persuade the Australian Customs Officer to stamp the export document. I took five exhibits – 30 frames. There were 315 frames of competitive exhibits in classes – Postal History, Aero, Postal Stationery including an Aerogramme Challenge, Revenues, Postcards, Polar, Frugal and Literature. In addition there were 18 frames of non-competitive material. There were four Accord Judges (NZ, UAE, South Africa and USA) and three apprentices. I was a member of the postal history ‘rest of the world’ team – some challenging exhibits and new topics for me, including three marcophily and two modern exhibits, a total of 15 exhibits (86 frames). I enjoyed the judging and it was done in an inclusive and congenial way. There were 27 dealers in attendance including coins/banknotes and postcards but predominately stamp dealers. Australia Post was present and, as usual, had limited quantities of a special issue for each day. Queues formed outside the venue well before opening time and on the first day the ‘specials’ were sold out in 35 minutes. Three different postmarks were used for the three days of the exhibition. An enjoyable Palmares was held at Wallsend Diggers, a RSL club with food service to the tables which made for a shorter event. It included the usual auction to bolster exhibition funds. NZPF donated a prize, designated the Jury Chair’s Encouragement Award, which was won by a new exhibitor for his 2-frame exhibit Postmark types of South Vietnam 1955-1975. Two senior Australian judges were undertaking judge assessments. I was invited to and agreed to participate. This involved being observed judging at the frames and being asked a number of judging related questions. I was given a copy of the assessment sheet. Overall this was a very positive judging and social experience. My thanks go to the exhibitors who supported this exhibition and to NZPF for appointing me as NZ Commissioner. Thank you for appointing me as replacement NZ Commissioner to PRAGA 2018 – an FIP Patronage Specialised World Stamp Exhibition in Prague, Czech Republic. The main part of the exhibition with the exhibits was in the Clarion Congress Hotel while dealers were in another hotel three stops on the metro plus 10 minute walk and the Literature exhibits were in a third venue, the Postal Museum. Norman and I went to the dealers. I visited every stand handing out NZ2020 flyers and talked to them about the venue, etc. Norman and I worked in the Bin Room (a long standing offer to Vit Vanicek) working from 8:30am to 11:00pm on day one. There were 379 exhibits – 38 Large Gold (1 in 10), 64 Gold (1 in 6) and 5 Felicitations. The overall standard was very high. Medals were ceramic with the exhibitor’s name in gold – very tasteful and lightweight. This took a long time as the frames dated from 1978 with glass and special handling required – this meant the OC needed to mount and dismount all exhibits. The Palmares was on the last day with exhibits able to be collected afterwards from 10 p.m. I presented an FIP Seminar on Open Philately. Norman and I attended the meeting of FIP Commission Chairmen/Secretaries with the FIP Board representative. The Board is pleased with progress in and results of Judge training courses. Norman pointed out that there were three lots of judging rules – GREV, SREV and Guidelines. As the detailed Guidelines generally repeated what was in the SREV, he suggested the SREV were not required. This was accepted and the simplified Guidelines currently being prepared for confirmation at Commission meeting in Bangkok would be on the basis of incorporating the SREV. Travel was by Emirates Wellington-Melbourne-Dubai-Prague. Czech Customs waved us from the Red to the Green Channel – no inspection. On return to Wellington, NZ Customs looked at both the Export and Import Entries and all OK. This was the 35th Asian International Stamp Exhibition (FIAP Patronage) held at the Venetian Macao – Conference & Exhibition Centre. It was organized by Macao Post & Telecommunications Bureau (CTT) and Clube Filatelico de Macao. Macao Post played a large part in the exhibition supplying most of the staff involved. The FIAP Coordinator was Prakob Chirakiti (FIAP President) assisted by Stephen Chan (Hong Kong). There were 226 exhibits in around 1004 frames plus 36 Literature exhibits – therefore slightly smaller than planned for NZ 2020. There were 27 Commissioners – including two each from Australia, China, Hong Kong and Japan. Classes were Championship, Traditional, Postal History, Postal Stationery, Thematics, Youth, Modern, Literature and One-frame (Traditional, Postal History, Postal Stationery and Thematic). Missing our were Aerophilately, Astrophilately, Revenue, Maximaphily and Open. There were 22 frames for the Court of Honour with one or two pages from each of previous Grand Prix winners. In addition to the three Grand Prix there were 25 Special Prizes – it was particularly pleasing to see all pictured in the Palmares. The NZ Special Prize of a Wahaika/Maori Club went to Massoud Farahbakhsh for Persian Postal Stationery in the Qajar Period 1876-1925 who was very pleased to receive it. Some exhibits with stamps relating to China but not produced in China had frames covered up e.g. Ghengis Khan. Taiwanese stamps inscribed ‘Republic of China’ had small pieces of paper stuck all over the Perspex. I took 24 frames and with Jenny’s help we hand-carried all including a number of double and wide pages. We were able to get Frank’s medal to him in the morning of the day he died. Congratulations to all exhibitors. Medals were given to all exhibitors including one-fame. They were very heavy at 495gm (including the box) meaning that for NZ there was an extra 4kg! Thanks to Stephen Chivers for carrying some to Wellington. The exhibition occupied barely one-third of a large hall – just one hall in the ‘Venetian Macao’ – a massive mix of hotel, shopping, exhibition halls and casino. The concrete floor was hard on the feet. There were 31 stands for dealers, auction houses, postal administrations plus five for security printers (Enschede, Cartor, Southern Print, Tullis Russell). Macao Cultural & Creative Industries occupied ten stands. Transport was provided morning and evening between the exhibition and the official hotel ‘Studio City’ (another large hotel, casino and shopping complex). Mounting exhibits: Commissioners checked into the Bin Room, confirmed they had all their exhibits and then went out to mount their own exhibits – there was no checking of inventories (these were between the exhibitor and the Commissioner). They returned to the Bin Room to sign the form confirming that all exhibits were mounted and secured in the frames. Dismounting exhibits: The reverse procedure operated except that Commissioners had to sign for each exhibit as it was dismounted as well as an overall signing in the Bin Room. Medals, certificates, Palmares and Special Prizes were collected from the Bin Room. New Zealand played an important part in running the exhibition. Jenny was Bin Room Manager – this included organizing Commissioners to mount their own exhibits and organizing the dismounting process. I assisted in the Bin Room and with mounting/dismounting. I was aware that I would be required to assist the Commissioner General with Commissioners’ Meetings – in practice this turned out to be running these Meetings on my own. Shuttle Raumati – Wellington Airport, Air NZ Wellington-Auckland, Air NZ Auckland-Hong Kong (0130 takeoff), Turbojet Ferry Hong Kong Airport-Macao, hotel shuttle to hotel – more transfers than usual. We were lucky not to be delayed by the typhoon. Hong Kong Airport reopened two days before we arrived and the Macao ferry service had resumed. The typhoon caused major damage in Hong Kong but then veered north. On arrival in Macao we noted a number of windows blown out and trees down. After her recent foot operation, Jenny wore a ‘moon boot’. Air NZ was excellent in providing wheelchairs but not the service from a separate company at Hong Kong Airport. In Macao there were no Customs requirements applicable. For NZ exhibit and flight information sent to Federation’s Customs Agent, Kevin Ross who prepared Export Entry & Import Entry. The latter was shown to Customs at Auckland with no queries or inspection. A separate note has been prepared of points which may be helpful to NZ2020 – especially the streamlined Bin Room and mounting/dismounting procedures. Finally, thank you to NZPF for appointing me as Commissioner and for the financial contribution to the fare. This annual event was hosted by Marlborough Stamp Collectors Club, the 2017 winners. Seven societies entered five frames each, making a total of 35 frames. Eight disciplines were represented, largest being eight frames of both postcards and aerophilately. Entries were judged and computer generated critiques written on the Thursday and Friday preceding the show at the club rooms. Exhibit title pages had been obtained and circulated prior to judging. There were 3 judges – David Loe, Josh Black and Sue Vernall (Convenor). Set up was Friday evening at the Redwoodtown Community Hall. In addition to the 35 competition frames Marlborough Club provided 48 frames of displays, making total of 83 frames. The venue was open Saturday to 4pm and Sunday to 3pm. Two dealers were present and the Marlborough Club also had a sales table. <tbody380</table?The weekend event was a credit to the Marlborough club, both in the display material they provided and the hours of voluntary labour to organise the event. One disappointing aspect of the weekend show was the few members of the public who attended despite prior advertising. However there were philatelic visitors from Christchurch and Waikato.The 2019 Inter club One Frame competition will be hosted by Wellington. See initial notification for this event above.